The Office Attire is clothing in Splatoon 2. The Office Attire consists of a white collared shirt and tie with a tan sweater vest, along with with black sleeve covers that reach up to the elbows. The tie is dark green with gold squid pattern. There is a logo on the left side of the chest of the sweater, as well as a tag on the right sleeve cover near the wrist. The Office Attire comes with a random main ability generated when the item is received. 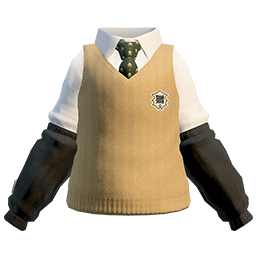 As a 3-star item, the Office Attire has three additional slots for secondary abilities. Since it is made by the Grizzco brand, it has equal chances to roll any secondary ability. Close up of the Office Attire. ↑ A pun on Jim Parsons.